Landmarks on the Thames Goldfield. A small A5 booklet full of colour photos, 36 pages. 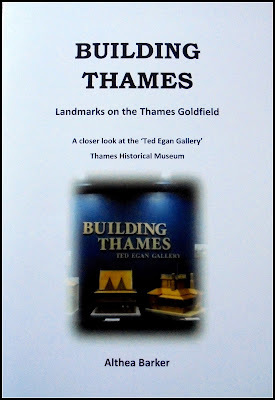 The booklet was prepared with the assistance of the Thames Historical Museum to showcase the replica buildings constructed of Mr T Egan. This is part of the journey with the ‘Heritage Rescue’ Choice TV programme, where a new gallery was constructed at the museum. 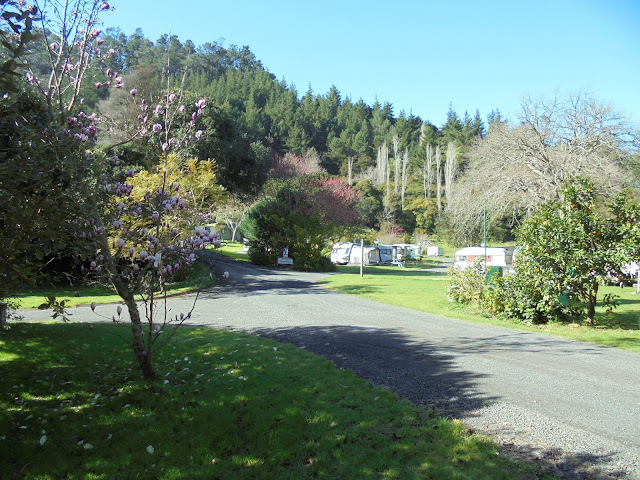 There is background on 28 buildings, including: Central Hall, Fishermen’s Buildings, Kauaeranga Hotel, Taipari Residence, Warwick Arms Hotel and many more. The booklets are available from the Thames Historical Museum and as required from the Thames School of Mines. Today the old Police Station and part of the courthouse remain standing and are in private ownership. The post and telegraph services were in high demand, even after the peak population dropped. Mail, banking and telegraph services a necessity. 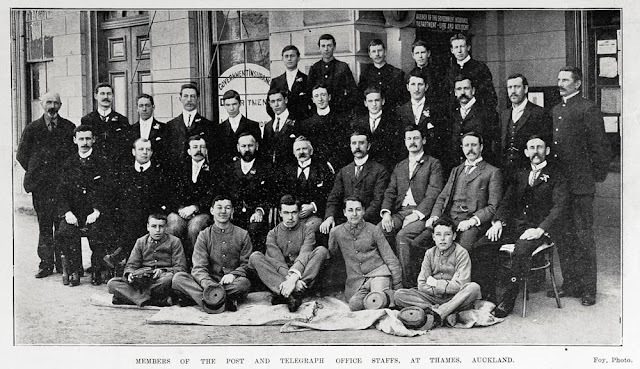 A large number of staff were employed at the Post and Telegraph Offices - as can be seen in the 1903 staff photo below. 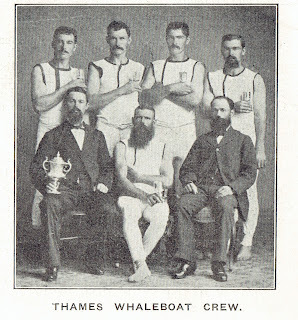 Back row: A V Pearse, J F Craig, T G Swindells, H G Sanders, H C Bull. 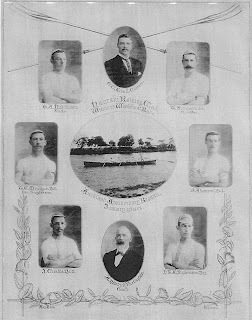 Third row: F Arns, H J Pearse, J Davies, T E Mullins, R McDonnell, A L H Stott, J McLean, E G May, C K Edwards, F L Cunnold, C H L McLean, J E Childerhouse. 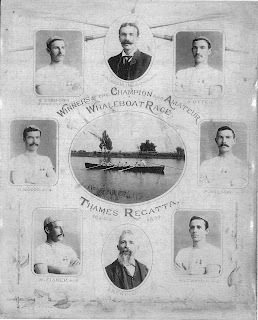 Second row: W B Teasdale, C W Jansen, J Thorne, T Aitken (chief clerk), W McHutcheson (chief postmaster), A H Turner (second clerk), E Clark, J T W Collier, T F Gibbons. The messenger boys at the front of the staff photo, were the equivalent of later telegram deliverers, in the days when it was quite customary to send urgent messages via the telegraph services. A telegram once received was hand delivered by the boys, by foot or by bike. Interestingly in the Thames Star 26 September 1911, a report about messenger boys was included. It stated: “No post office messenger boy in England is supposed, in the discharge of his duties, to walk more than ten miles a day, or to cover more than 24 miles on a bicycle.” Unfortunately they did not state what the norm was for the Thames messenger boys. By December 1916, Thames had eight messenger boys employed at the Thames Post & Telegraph Office. They were: A Anderson, C Comer, R J Donnelly, L R Hancock, F M J McGuinn, W H McDonald, S E L McLean, and F Strange. This wonderful Xmas card (above) belongs to John Strange, his father Frank Strange was one of the messenger boys named on the card. Frank went on to work 25 years in the Post and Telegraph service. 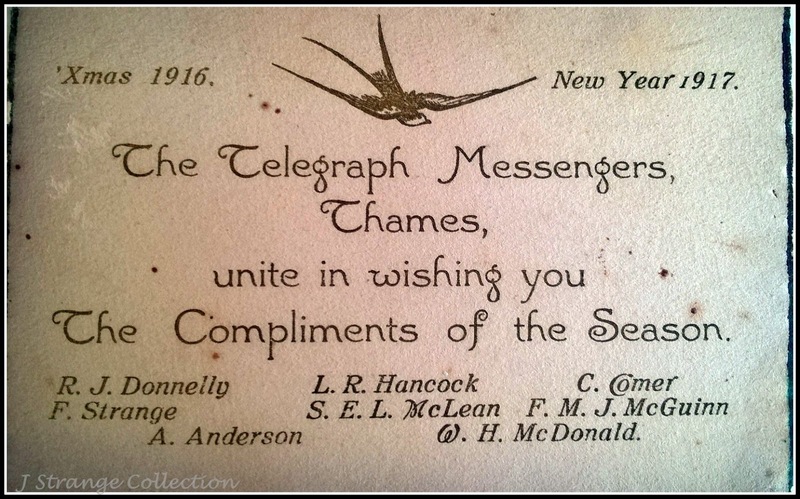 The card is fascinating, the business acknowledging the work of the messenger boys and giving seasons greetings to their customers. It is a tradition that New Zealand Post appears to have continued, each Xmas it remains one of the few businesses that send a card out delivered by their 'posties'. Some later background on Mr Francis (Frank) Strange (1900-1998). 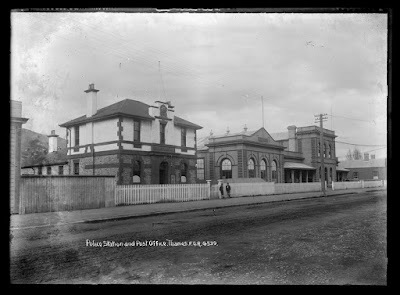 Frank "was a sorter on the mail train to Wellington and would get off at Whangamomona and return sorting again back to Auckland. He attended the Ponsonby Post & Telegraph and became an experienced and sought after Morse code operator. In April 1928 he married and he was transferred to Whangarei Post Office until he became Post Master at Kamo. In 1940 he cashed in his Pension and bought a herd of cows and property at Hikutaia where he remained" until his death aged 98yrs. 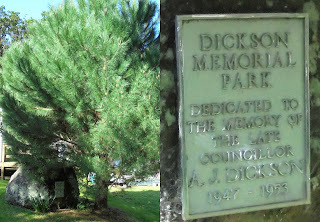 DICKSON PARK - located at the east end of Victoria Street, Tararu, Thames. 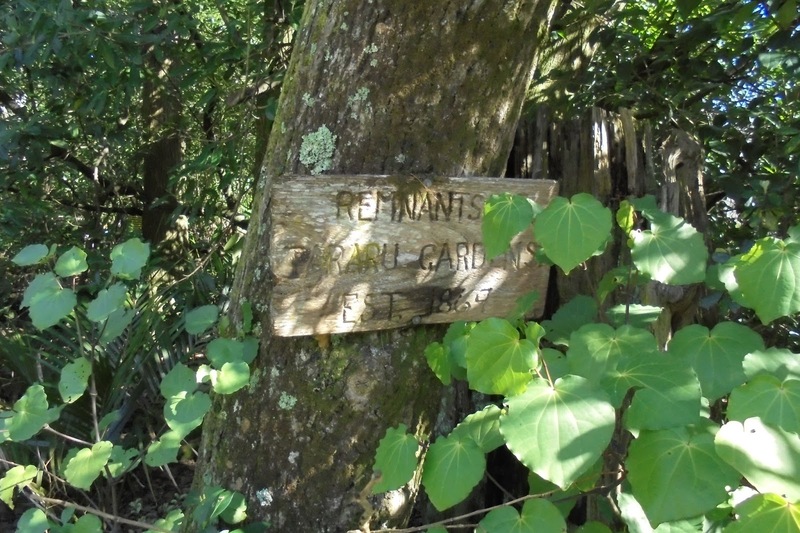 Remnants of the Tararu Gardens are signposted at the entrance to the Dickson Holiday Park. From the time the Thames Goldfield opened, there was a special area at Tararu where Thamesites would travel to escape the noise and dirt of their mining town. 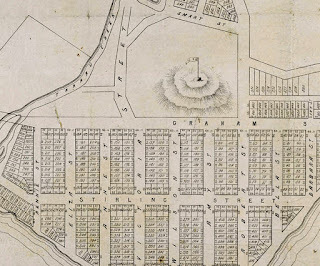 The brainchild behind the Tararu Gardens was Mr Robert Graham, the Auckland property developer who subdivided Grahamstown and Tararu c1868. There was a major storm in 1874 that destroyed the Tararu Wharf, badly damaged Robert Graham’s hotel and his beloved Tararu Gardens. Following these series of events, Mr Graham left Thames, having his hotel shipped to his Waiwera Hotel site. Thankfully new of proprietors and owners kept the Tararu Gardens operational. Larger sports events were held on the main Tararu Flats where the Thames Hospital Board farm and Tararu Home was relocated (now Bupa Tararu Rest Home and Hospital). In the Thames Star 15 March 1888, Mr R R McGregor, auctioneer of Thames had been authorised to sell the Tararu Gardens by order of the mortgagees. 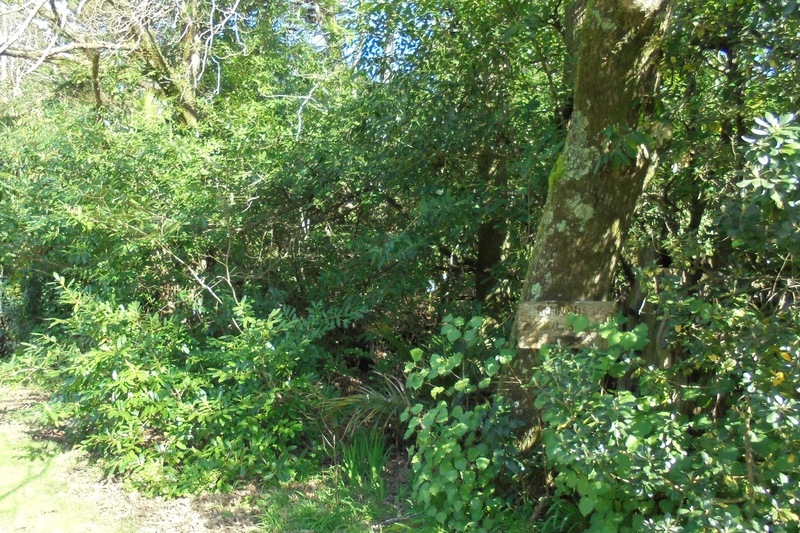 The land described as being part of Block Kauaeranga E, No 14. In another section Mr Robert Graham Esq, was reported as the late owner, it is not clear whether this meant he was the current owner. At the auction the bidding reached 500 Pounds, the property was withdrawn as this was 90 Pounds under the reserve price set before the auction. The next we hear is that the gardens are in the procession of the Thames Building Society, who offered them for sale in January 1890. A correspondent wrote to the Thames Star newspaper on 10 February 1890 and suggested wisely that the Borough Council should purchase the gardens as a recreation ground for the town. The matter dragged on. 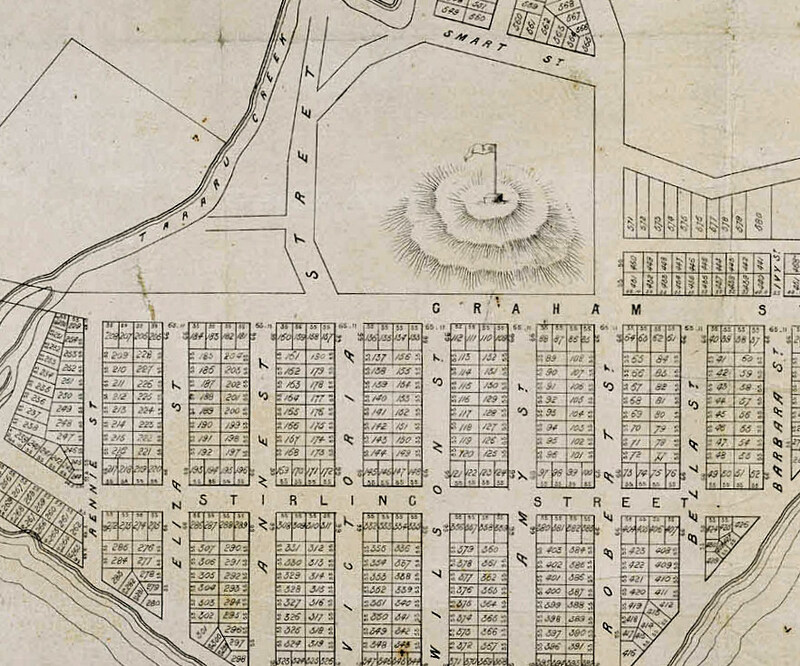 In 1891 the council was offered the gardens and surrounding grounds for 625 Pounds. 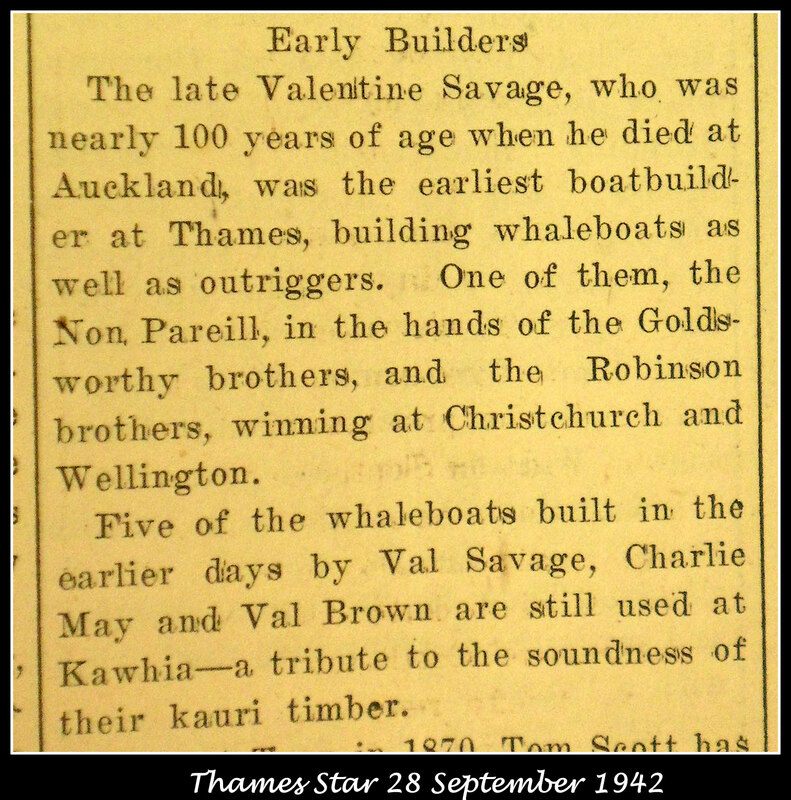 The Thames Star 6 February 1891, had the news that the Thames Borough Council had decided not to buy the Tararu or Parawai Gardens as recreation areas for the town, deeming them not suitable. By 1892 the Building Society still had the mortgage on the property and wanted urgently to sell the Tararu gardens. 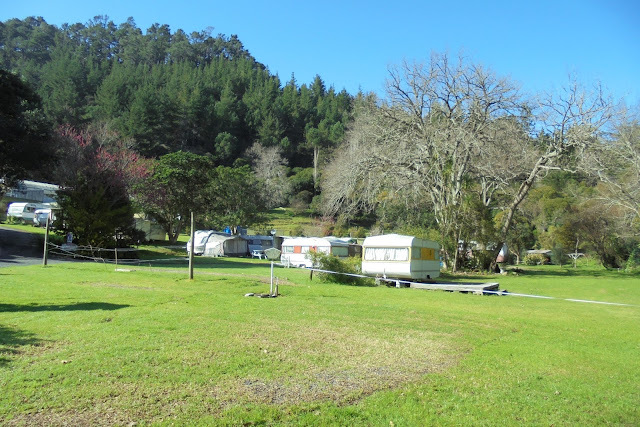 The news came at the end of 1892 that Mr R Comer had purchased the property for 300 Pounds, then immediately offered it to the council at that price, so they could be used as a recreation ground for the town. In the end, a vote was held so that the people of Thames could decide whether the gardens should be purchased. The poll required 373 votes in favour, but sadly only 121 votes were for it and 48 against. So it was left to Robert Comer to continue to run the gardens, at the end of 1893 the entrance fee was reduced to entice customers. Then once again at the beginning of 1894 the property was yet again on the market. During all these years of continual for sale notices, the paper is still full of people going to the gardens to enjoy picnic and other events. In 1896 the gardens were the property of Mr J W Walker, who proceeded to build a large villa residence shortly after the purchase was complete. 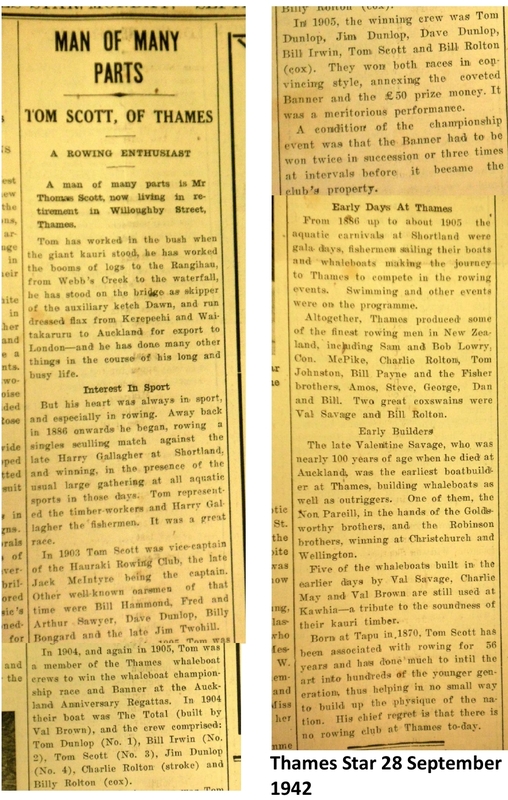 (5) In the Thames Star 16 August 1907, the property was again for sale. It was advertised as the residence of the late Mrs J W Walker, the land was 10 acres – formerly the Tararu Gardens. 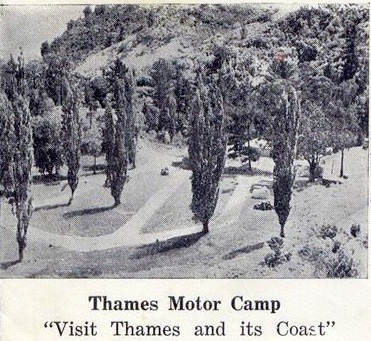 The following years are yet to be explored but by 1953 the garden area was the Thames Camping Ground. Above: The Memorial plaque for Mr Dickson on the rock (left photo), closer view on the right. 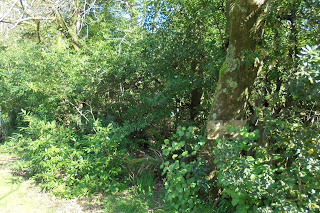 (1) Waiotahi Creek School, by Althea Barker. 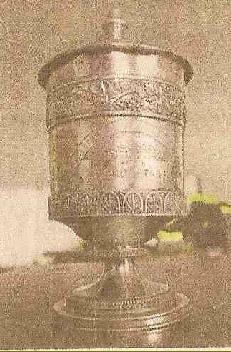 (2) Thames Star, 11 March 1918. 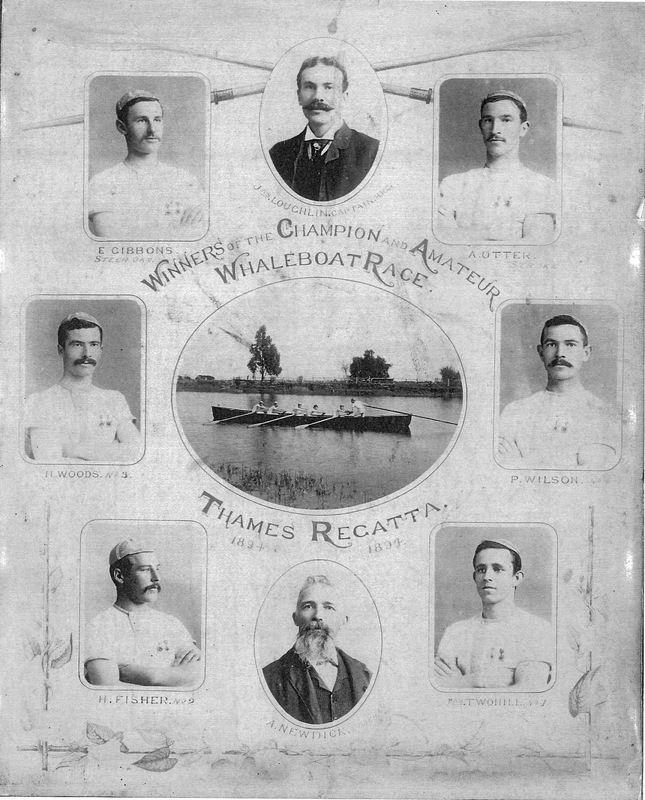 (3) Thames Star, 4 December 1876. 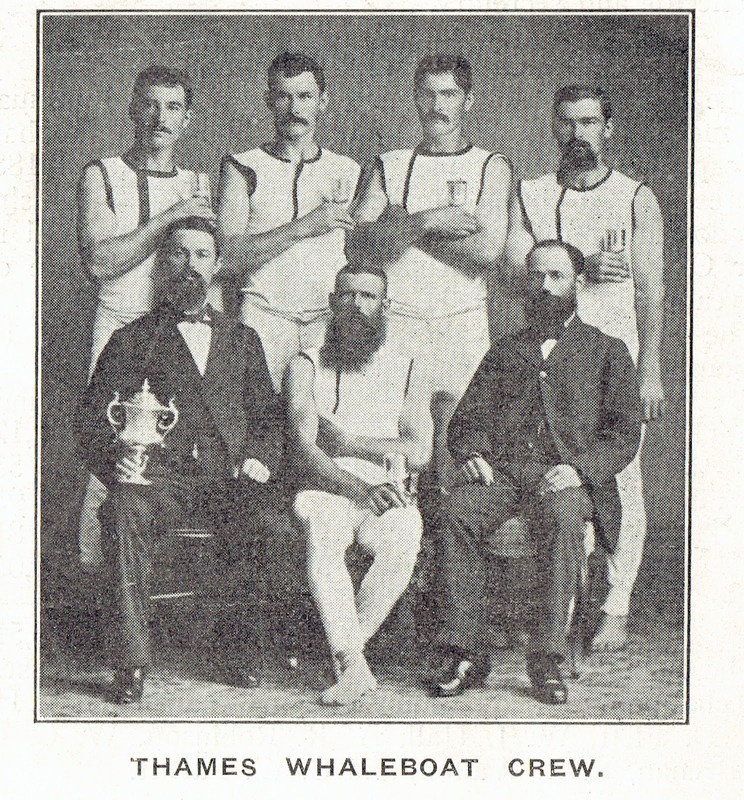 (4) Thames Star, 20 October 1879. (5) Thames Star, 28 July 1986. (6) Thames Star, 9 September 1953. (7) Thames Star, 2 September 1953. 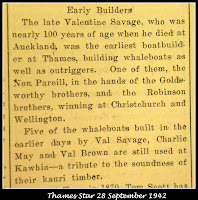 Old Tararu Gardens an Important part of early Thames, Thames Star, 20 June 1952.